Juan D'Vaughn Pierre (born August 14, 1977) is an American former professional baseball outfielder. He played in Major League Baseball (MLB) from 2000–2013 for the Colorado Rockies, Florida/Miami Marlins, Chicago Cubs, Los Angeles Dodgers, Chicago White Sox and Philadelphia Phillies. Known for his speed, he stole 614 bases in his career, the 18th most in MLB history at the time of his retirement. He now works at MLB Network as an on air analyst. Pierre, who was named after Dominican Hall of Fame pitcher Juan Marichal, went to high school at Alexandria Senior High School in Alexandria, Louisiana. Prior to his professional career, he played at Galveston College and the University of South Alabama, where he was 1998 Sun Belt Conference Player of the Year. Pierre began his professional career with the Portland Rockies of the Northwest League, after being selected by Colorado in the 13th round of the 1998 MLB draft. He won the league batting and stolen base titles in his first professional season with 38, and was a fan favorite even at that level. Pierre moved on to the Asheville Tourists the following year, again batting well over .300, and began 2000 with the Carolina Mudcats before finishing the year in Colorado. Pierre made his major league debut on August 7, 2000, as a pinch runner for the Rockies against the Pittsburgh Pirates. He made his first start in center field the following day and got his first hit in the first inning off José Silva. On November 16, 2002, Pierre was traded along with Mike Hampton and cash to the Florida Marlins for Charles Johnson, Preston Wilson, Vic Darensbourg, and Pablo Ozuna. In the 2003 regular season, Pierre posted a .305 batting average, led the NL in games played (162), at bats (668), stolen bases (65), and sacrifice hits (15), and led the majors with the lowest strikeout percentage (5.2%), During the post-season, he was a major contributor to the Marlins' 2003 World Series championship. He batted .333 in the World Series and .301 overall in his first playoff experience. In 2004, he led the National League in at-bats (for the second year in a row) with 678; hits (221); triples (12); games played (162); bunt hits (24); infield hits (38); (5.2%). In addition, he was the only major league player to play every inning of each of his team's games. In 2005, Pierre led the National League in games played (162), and had the third-lowest strikeout percentage in baseball (6.9%). Pierre batting for the Cubs in 2006. On December 7, 2005, the Marlins traded Pierre to the Chicago Cubs, receiving pitchers Sergio Mitre, Ricky Nolasco, and Renyel Pinto in exchange. The deal was motivated by the Marlins' need to cut payroll after finding itself unable to secure a new stadium deal in South Florida. In 2006, while batting .292, Pierre led the NL with 204 hits, winning his second hit title, and in at-bats (699), games played (162), bunt hits (21), infield hits (30), and in lowest strikeout percentage (5.4%). He also tied for the major league lead in times reached base on an error (13), and played perfect defensive baseball, earning a fielding percentage of 1.000. However, he also led the major leagues in outs made (532), the second-highest out total for a player since 1982. On November 22, 2006, Pierre signed a $44 million contract with the Los Angeles Dodgers. In 2007, Pierre led the majors in bunt hits (19). He also led the NL in games played (162) for the 5th straight year, and singles (164) for the second straight year, led the league in sacrifice hits (20), and had the lowest strikeout percentage in the NL (5.5%),. He was 2nd in the NL in stolen bases (64), 3rd in at bats (668) and plate appearances (729), 4th in hits (196), and 9th in triples (8). Pierre during his tenure with the Dodgers in 2008 spring training. Going into 2008, the Dodgers signed Andruw Jones to a two-year contract to play center field. Because of this, Pierre shifted to left field. After a trip to the DL in July, Pierre was moved into a platoon in center field with the struggling Jones. When the Dodgers traded for Manny Ramirez, Pierre moved to the bench and saw limited action, primarily as a pinch runner the rest of the season. Manager Joe Torre said of Pierre on MLB.com. "I've delivered bad news to him two years in a row -- first with Andruw Jones, then when Manny came on board. He's more understanding about being a backup. He's been a pro through this whole thing." After nearly 2 years without hitting a home run, Pierre hit a ball into the right field seats at PNC Park in Pittsburgh on September 15, 2008. It was Pierre's first traditional fly ball home run since August 28, 2006, also in Pittsburgh. 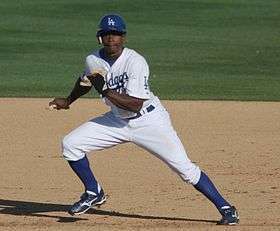 Prior to the 2009 season started, the Dodgers gave Pierre and his agent permission to talk to other teams in hopes of working out a trade, since Ramirez's re-signing with the Dodgers pushed Pierre to the backup role in left field. When Manny Ramirez received a 50-game suspension, Pierre once more became the Dodgers' regular left fielder. During Ramirez's suspension, Pierre delivered a stellar performance that drew praise from fans and critics alike. However, once Ramirez returned, he resumed his previous role of a backup player. In recognition of his hard work, Dodgers fans gave him a standing ovation on July 16, the same game where Ramirez had his first home game since returning from suspension. On December 15, 2009, Pierre was traded to the Chicago White Sox for two minor league pitching prospects to be named later (Jon Link and John Ely). Pierre led Major League Baseball with 68 stolen bases, the second-most in a single season in franchise history after only Rudy Law's 77 in 1983. On August 3, 2010, he hit his first and only home run of 2010 off of Rick Porcello. On August 5, 2010, he stole his 500th career base against the Detroit Tigers. In 2011, Pierre led the major leagues in sacrifice hits (19) and at bats per strikeout (15.6), and was caught stealing a major-league-leading 17 times (while stealing 27 bases). On defense, he tied for the major league lead in errors by a left fielder, with 7. 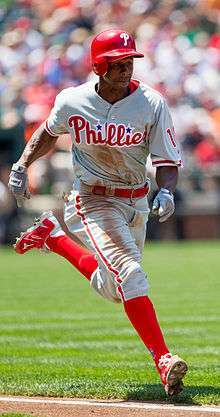 On January 27, 2012 he signed a minor league contract with the Philadelphia Phillies. The Phillies purchased his contract on March 29, and he was subsequently added to their Opening Day roster. He hit a three run home run on June 23. On June 28 he got his 500th career RBI. In 130 games, 98 starting in left field, Pierre hit .307/.351/.371 with 6 triples and 37 stolen bases. On November 17, 2012, Pierre signed a one-year, $1.6 million deal with the Miami Marlins. He played the 2013 season with Miami and became a free agent at the end of the season. He had hoped to sign with another team and was often mentioned in press reports about teams requiring depth in the outfield to cover for injured or under performing players. However, he went unsigned for the entire season and announced his retirement from professional baseball on February 27, 2015. 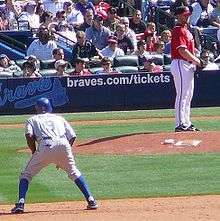 Pierre leading off second as Braves reliever Blaine Boyer checks the runner in April 2008. Pierre was the only player in baseball to play every inning of all his team's games in 2004, and was only the third player to do it since 1971. On May 9, 2006, Pierre robbed the San Francisco Giants' Barry Bonds of a career 714th home run, which would have tied Bonds with Babe Ruth for second on the all-time list, by catching the ball right before it topped the fence. On July 29, 2008, Pierre stole his 100th base with the Dodgers, becoming only one of four players in MLB history to steal at least a hundred bases with three different teams. He previously stole 100 with the Colorado Rockies and 167 with the Florida Marlins. Tommy Harper, Brett Butler, and Otis Nixon are the only others to have accomplished this feat. Pierre tied former Dodger Steve Sax on the top fifty career MLB stolen base leaders list with 444 on June 12, 2009, against the Texas Rangers in Arlington. The next day, June 13, he pushed Sax out of the top 50 with his 445th steal, again versus the Rangers in Arlington. On June 13, 2010, Pierre broke up Ted Lilly's Crosstown Classic no hitter with a hard hit line drive up the middle with no outs in the top of the ninth. On September 8, 2011, Pierre picked up his 2,000 hit against the Cleveland Indians. Pierre stole his 600th base against the Philadelphia Phillies on May 2, 2013, becoming the 18th player in MLB history to reach that mark. Wikimedia Commons has media related to Juan Pierre. 1 2 "Baseball Leaderboard – Advanced – Fan Graphs – 2004". Fan Graphs. Retrieved 2007-08-20. 1 2 "Baseball Leaderboard – Batted Ball – Fan Graphs – 2004". Fan Graphs. Retrieved 2007-08-20. ↑ "Baseball Leaderboard – Advanced – Fan Graphs – 2005". Fan Graphs. Retrieved 2007-08-20. ↑ "Baseball Leaderboard – Batted Ball – 2006 – Fan Graphs – 2006". Fan Graphs. Retrieved 2007-08-20. ↑ "Baseball Leaderboard – Advanced – Fan Graphs – 2006". Fan Graphs. Retrieved 2007-08-20. ↑ "2006 Major League Baseball Baserunning/Misc". Baseball-Reference.com. Retrieved 2011-10-17. ↑ "Baseball Leaderboard – Advanced – Fan Graphs – 2007". Fan Graphs. Retrieved 2007-08-20. ↑ "Juan Pierre finally gets his due". Articles.latimes.com. 2009-07-19. Retrieved 2011-10-17. ↑ Gurnick, Ken (December 18, 2009). "Dodgers, White Sox complete Pierre deal". MLB.com. Retrieved February 28, 2015. ↑ Gonzales, Mark (September 22, 2010). "Sox to pick up Thornton's option". Chicago Tribune. Retrieved February 28, 2015. ↑ Gregor, Scot. "White Sox' Pierre always ready". Daily Herald. Retrieved February 28, 2015. ↑ "Adam Jones Statistics and History". Baseball-Reference.com. Retrieved 2011-10-17. ↑ "Juan Pierre Statistics and History". Baseball-Reference.com. Retrieved 2011-10-17. ↑ "2011 Regular Season MLB Baseball LF Fielding Statistics". Espn.go.com. Retrieved 2011-10-17. ↑ "Phillies sign Juan Pierre". Comcast SportsNet Chicago. 2012-01-27. Retrieved 2012-04-04. ↑ Frisaro, Joe (November 17, 2012). "Pierre headed back to Marlins". MLB.com. ↑ "Juan Pierre retires after 14 years". ESPN.com. Associated Press. February 27, 2015. Retrieved February 28, 2015.